A modern family space with lots of room to relax. how long did it cure before you sandblasted this? love this beautiful! sand blasting is the most controlled way to texture the surface. the result is a wonderful monochromatic finish in the color concrete with a slight sanded texture. where can one get this umbrella? Visit the shadescapes website for info on this umbrella. is this fire proof ? BBQ Grill - What is the make/model? Call Kalamazoo Grills. This model is 4yrs old. Nice choice on the wood - What kind is the wood behind the grill? Umbrella SizeThe size of your umbrella will determine how much shade your space will receive. Think about how much shade you want and how much room you have. 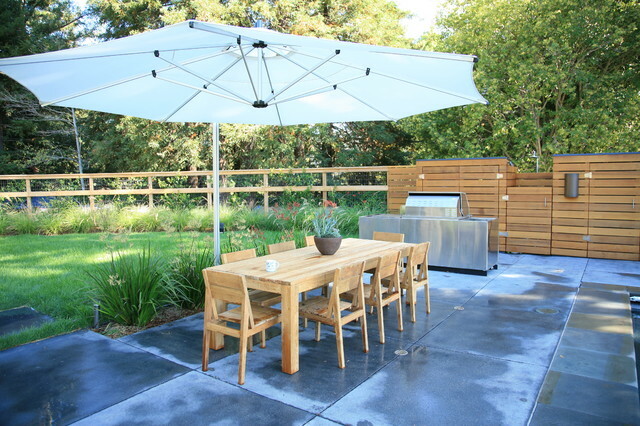 Overcrowding your patio with a too-large umbrella won't look or feel good. Designer tip: Landscape designer John D’Urso says umbrellas ideally should be table width plus an extra 2 feet per side if possible. For example, if you have a 4-foot round table, look for an umbrella that's 8 feet in diameter. 4. Stay cool with a big umbrella. An extra-large freestanding umbrella offers more flexibility than one attached to the table. Use it to shade the prep area (keeping food out of the sun), then move it to cover the eating area when it's time to sit down.